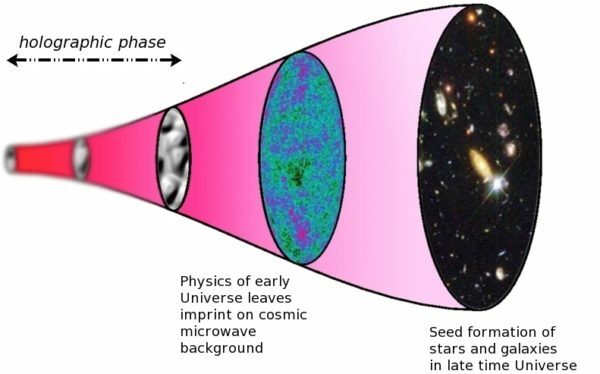 Scientists Find Observable Evidence That Our Universe Is A Complex Hologram! A holographic universe, an idea first suggested in the 1990s, is one where all the information that makes up our 3-D ‘reality’ (plus time) is contained in a 2-D surface on its boundaries. “Imagine that everything you see, feel and hear in three dimensions (and your perception of time) in fact emanates from a flat two-dimensional field. The idea is similar to that of ordinary holograms where a three-dimensional image is encoded in a two-dimensional surface, such as in the hologram on a credit card. However, this time, the entire universe is encoded.” says Kostas Skenderis, professor of Mathematical Sciences at the University of Southampton. Scientists detected a vast amount of data hidden in the ‘white noise’ or microwaves (partly responsible for the random black and white dots you see on an un-tuned TV) left over from the moment the universe was created. Using this information, the team were able to make complex comparisons between networks of features in the data and quantum field theory. They found that some of the simplest quantum field theories could explain nearly all cosmological observations of the early universe. In other words, hiding in the microwave background scientists found observable evidence that suggests our Universe is a complex hologram. In fact, there is as much evidence as there is for the traditional theory of cosmic inflation that deals with explanation of these irregularities, or any other theory. Some argue that the leading theory with the most accurate explanation of The Universe is, in fact, this one. It’s like watching a 3D movie in cinema. The pictures we see have height, width and crucially, depth. But everything we see originates from a flat 2-D screen. The only difference is that we can touch objects and the ‘projection’ is ‘real’ from our perspective. Imagine that you are actually a 2D object living as if you were a 3D one. Like you are the character in a 3D movie. From your perspective (and from the character’s perspective) the world around you is 3 dimensional. But everything you see around you, everything that happens, comes from the 2 dimensional structure of The Universe, which is like the code that shows you images on your screen (even reading this article).